Polished platinum plain gold cross pendant made using the finest 950 grade platinum. 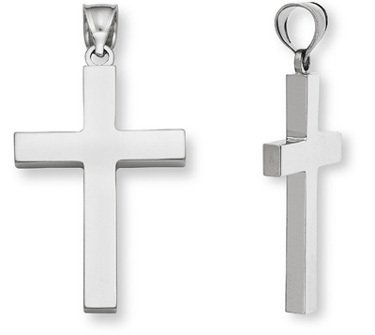 This solid platinum cross pendant is a striking and powerful symbol of faith. Crafted from the finest 950 grade platinum and polished to a high shine, this piece is a timeless representation of your devotion to your Savior: by wearing a cross that's crafted from such an incredibly precious metal, you demonstrate that your faith is incredibly precious to you. This inch-high cross will always be in style and will never fail to serve as a gleaming reminder of that you believe. Cross pendant measures approx. 1" tall x just under 3/4" wide and approx. 1.75mm thick (1 1/4" tall with hoop/bale). Back is engraveable (optional, 8 characters allowed). Also available in 14k white gold, 14k yellow gold, or 18k gold or a larger version (shown below). We guarantee our Plain Platinum Cross Pendant to be high quality, authentic jewelry, as described above.